One of the newest additions to the Active Autowerke exhaust collection has become a real hit in the F8X community, just in time for the holidays! If you haven’t seen – or heard – our F8X M3 & M4 rear exhaust then you my friend are missing out! What really sets it in a class of its own is the quality and care that has gone into the research and development of the product. The Active Autowerke F8X M3/M4 exhaust is a made in the USA product. We manufacture each one by hand at our local shop in Miami, Florida. While the quality of the product is one of it’s most attractive qualities, that is definitely not the only draw of our F8X M3/M4 rear exhaust. There are many other reasons why enthusiasts are making sure it is on their holiday wish list this year. Not only does it sound terrific during start up, but that deep, throaty growl carries all the way through open throttle. The specialists at Active have also put emphasis on designing and creating a stylish product to guarantee an awesome look for your F8X. Most importantly, the significant gains in horsepower and torque with the addition of F8X M3/M4 rear exhaust are huge advantages for drivers. Forget holiday carols, the sound form the Active Autowerke F8X M3/M4 rear exhaust is the real music of the season. It creates a deep growl that is admired by many car enthusiasts, and should’ve came with the car from the factory! 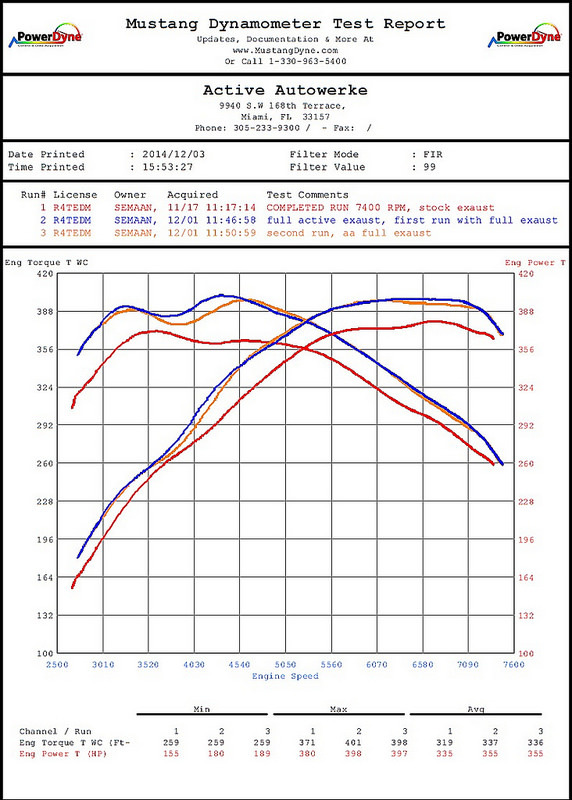 We were able to eliminate the high pitch drone stock exhaust systems are known for, and replace it with a note that is much more sophisticated and aggressive. We did this by adding two silencers to the exhaust. One is located in the midpipe which has a small crossover that allows for noise dampening. The other is in the muffler which has a reflection chamber that acts as the silencer on either end of the chamber. Our F8X M3/M4 rear exhaust paired with our F8X M3/M4 mid pipe sounds phenomenal during wide open throttle. Check out this in-depth review on BimmerPost to hear for yourself! Not only does our F8X M3/M4 rear exhaust sound great, the quad tips included are beautiful. 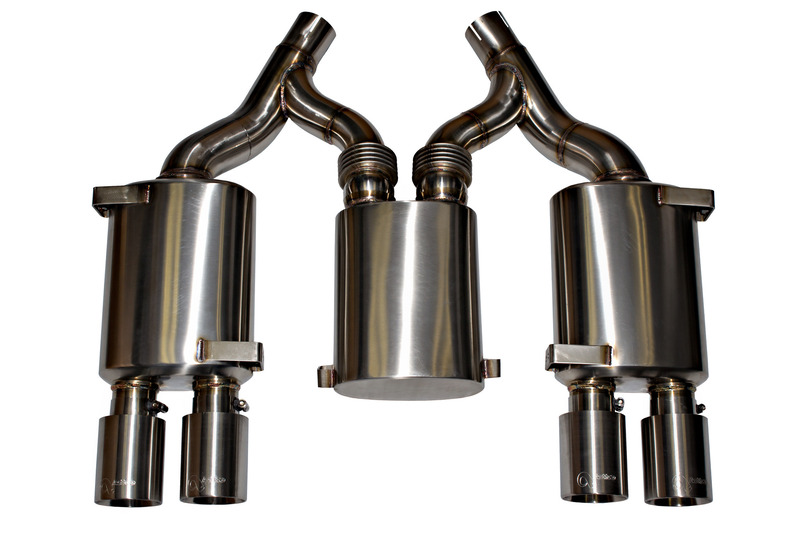 This exhaust features double-walled, stainless steel, polished tips for an unmatched view from behind. 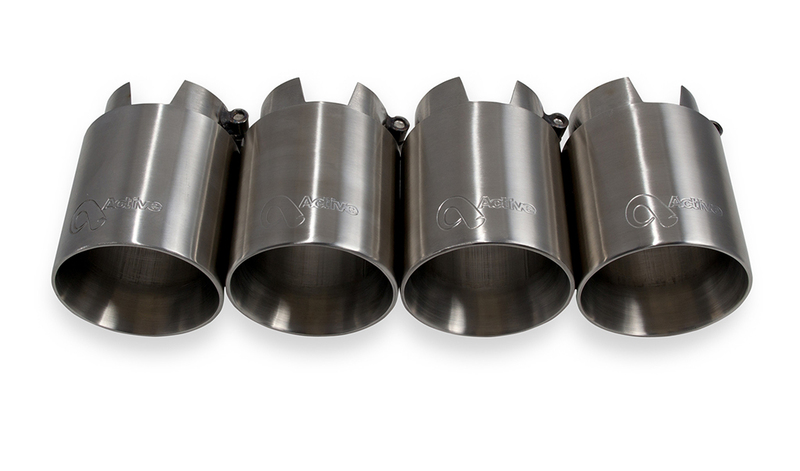 These tips give the exhaust a much more aggressive and appealing look over the stock system. Let’s be honest, improved sound and style are crucial but it is the power gains from our F8X M3/M4 axel back exhaust that really make this the ultimate performance enhancement for your ride. Owners can expect to gain 18+whp and 30+toque over stock by adding our rear exhaust when paired with the Active Autowerke F8X Mid-Pipe! With huge benefits like these, it is easy to see why the Active Autowerke F8X M3/M4 rear exhaust has become one of our most sought after BMW performance parts. Make sure your friends and family know exactly what you want for the holidays this year!